At first glance, Mai Kawasumi seems to be a taciturn and unapproachable, but otherwise perfectly mundane high-school student. That is, if one can overlook her habit of prowling the school corridors at night with an entirely genuine sword in her hands. Her explanation, �demon hunting�, breeds as much fear as it does outrage. It is no wonder, then, that as her notoriety grows, she is left alone... almost. What becomes a lifeline for Mai is her unconditional friendship with Sayuri Kurata, an eternally high-spirited girl from a rich family, and a new acquaintance with the recently-transferred Yuuichi Aizawa. Together, they enjoy the simple pleasures of life, bringing to light Mai�s love of animals, taste for good food and even... sense of humor. Those happy days cannot continue forever, though. Reality catches up to Mai as the demons she had fought start attacking her friends, threatening to take away from her what she values above her own life. In the face of tragedy, Mai�s resolve is turned into steel. She sets out to finish her crusade once and for all. As the number of remaining demons dwindles, Mai faces her past and the truth about the creatures she slays. 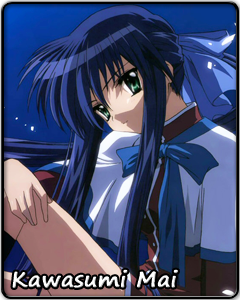 But when she and Yuuichi finally bring the quest to an end� will Mai be able to face herself?